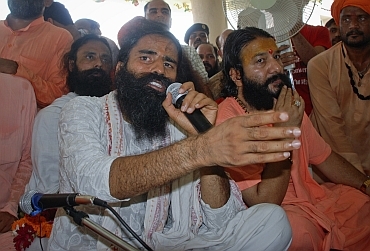 Undeterred by his forceful eviction from New Delhi, Baba Ramdev resumed his agitation at his ashram in Haridwar, saying the 'satyagraha' will continue till his demands on curbing corruption and black money are met by the Centre. Baba Ramdev sat on 'satygraha' along with his supporters and disciples at 'yagyashala' of his Patanjali Yogpeeth late Sunday night, yogpeeth sources said on Monday. The yoga guru, who was bundled out of the national capital after police crackdown on his followers, tried to resume his satyagrah in Noida on Sunday but was not allowed to enter Uttar Pradesh. He was stopped on the border of Muzaffarnagar district at Bhuraheri police check post where the administrative officials asked him to return to Uttarakhand. Later, Baba returned to Patanjali Yogpeeth and began his fast. Baba told his followers that he will continue his satyagraha till his demands on curbing corruption and black money are met by the centre. 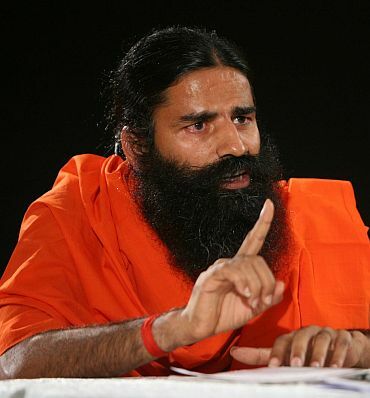 Ramdev had on Sunday said, "No one should violate law and so I am not going to Delhi. I was not allowed to reach Noida in UP to continue the protest. Now it will happen here". He had said that the government can stop him from entering Delhi for not more than 15 to 30 days and he will come again to the national capital. Uttarakhand Chief Minister Ramesh Pokhriyal Nishank had on Sunday evening met Baba Ramdev in Yogpeeth and assured him full support and security if he wanted to continue his fast. Former Uttarakhand Chief Minister and veteran Congress leader N D Tiwari had also travelled to Yogpeeth to meet Baba Ramdev and lent his full support to the cause for which he is fighting. 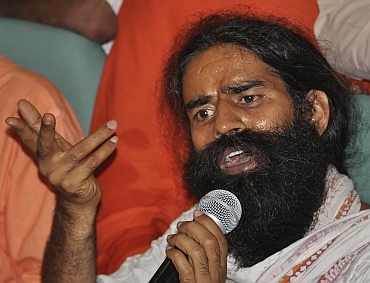 The Uttarakhand BJP has announced that it will observe a "black day" at all district headquarters on Monday to protest the police crackdown on Baba Ramdev and his supporters. Yogpeeth sources said that if the number of those sitting on fast with Baba increases, the venue of satyagraha can be shifted to a bigger hall in phase II of Patanjali Yogpeeth.